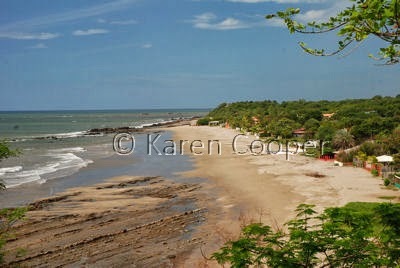 Just when I thought I had seen the most spectacular ocean scenery ever, I took a trip to a small community on the Pacific coast of Nicaragua called Casares. Casares is about 70 km south east of Managua or about an hour and half drive from Granada. Right on the ocean. With miles of open fields and views of volcanoes to boot. I'm not sure it gets much better than this. I can't even get it all in on one photo. And its definitely off the beaten touristy trail. Personally, I don't like the beaten touristy trail places. I like getting out and "discovering" these stunningly beautiful places myself. Okay, so maybe I am not the first one to leave my footprints on the beach here. But I sure make everyone I am with really, really annoyed with me when I keep saying "Oh-my-gosh-this-is-soooo-incredible!". I wonder if Christopher Columbus ever got anyone annoyed with him? Where is it in relationship o San Juan de Sur? Very nice photos. I am going to add you to my blogroll if that is alright. I enjoy coming here. Hi lhotze .. Casares is north of San Juan del Sur. There is a very rough road that connects them along the coast I hear, though I haven't personally been on it yet. davidlind -- thanks for the add! your pictures are gorgeous! makes me so jealous! i enjoy getting off the beaten path myself - want to get to the places that most people miss!